I am off at Mixed Con this weekend. So I am going to make this post short and sweet. And when I say sweet I mean really sweet. 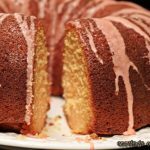 I was inspired to make this Shirley Temple Bundt cake after making Shirley Temples this summer. I grew up having Shirley Temples as a treat when we visited restaurants. We did not go out to eat very often so getting one of those sweet cherry drinks was a supreme treat. 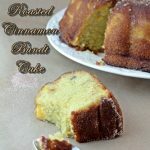 When Bundt-a-Month announced the theme for the December I have to admit it stumped me. The theme is “boozy” and those of you who are regular readers know Lunie is not able to drink due to a medical condition. I still wanted to participate so I asked if doing a bundt based on a virgin drink would be okay. Luckily they said yes and I immediately knew exactly what I wanted to make. I have cherries on the brain these days. I did a cherry extract recently that is so easy to make you must try it. I also did a chocolate/cherry/pistachio cookie that is fairly healthy by Lunatic standards. I have another batch of cherry extract brewing up as well. So it was an easy leap to something cherry. I hope you enjoy this. I’ll tell you right now the photos are not stellar. I am in the process of redoing the blog room/studio so I had no room to shoot in. My lights are in storage during the painting process so I had to use yucky kitchen lights. So please excuse the photos. I’ll try to whip up a new one when I get home and my blog room is back together. I think they would be adorable in mini bundt pans. An easy recipe inspired by Shirley Temple Drinks we all loved as kids. In a medium bowl whisk together flour, lime zest, baking soda and salt. Set aside. In a stand mixer combine butter and sugar, mix until fluffy. Add eggs one at a time, beat after each addition. Add lime juice. With mixer on low setting alternate flour mixture and yogurt, mixing briefly between each addition. Don't overmix! Add the cherries, cherry juice and grenadine. Mix just till colour mixes. Pour into prepared pan. Tap slightly on the counter. Place in oven and bake for about 55 minutes. 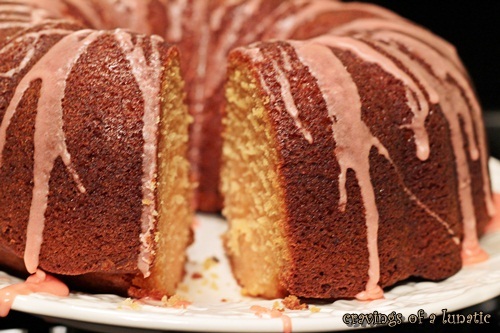 Prepare glaze by just whisking the ingredients together and pouring over bundt cake. Serve with a big old I Love Shirley Temple smile! 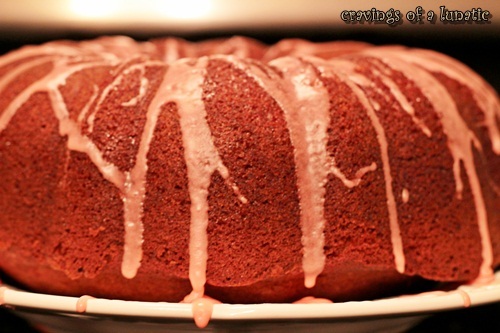 I used Martha Stewart’s Lemon-Ginger Bundt as a jump off point for the recipe. Obviously I changed ingredients but wanted a basic bundt recipe to follow. I don’t care for sour cream in baking so I use yogurt instead. Adds a nice taste and makes for a moist cake. If you have never baked with yogurt you must try. Thanks so much for visiting. Make sure you visit all the other participants. These folks super talented and will rock your socks…right off. – Link back to both Lora and Anuradha’s announcement posts. I’ve never had a Shirley Temple. Still don’t feel a yen for one, but I definitely could dive into this cake. It looks delicious. That turned out beautiful, Kim! I love the pink drizzles all over. I don’t remember ever getting to drink Shirley Temples as a child but I surely made them for my daughters. Such a girly drink, don’t you think? I am sure you are having fun at Mixed. Can’t wait to hear all about it! 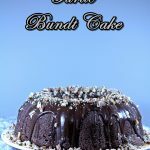 seriously: the bundtamonth thing? GENIUS. 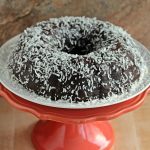 and boozy bundts for the holidays? i love you, and i love that all of you are going to the trouble to create for me SO MANY NEW BUNDT recipes my head may explode. Cherries and lime, that´s a new and very interesting combination! I have fresh cheeries here now, and I bet this cake will be wonderful with them. Gorgeous bundt Kim! Now I have cherries on the brain and want a piece of this cake more than anything right now. This looks absolutely divine. Love it. Happy #BAM. Pinned. LOVE this! I am seriously amazed at how inventive everyone got with this theme!! the recipes are amazing! And hello! what’s wrong with your photos. I think they look great and make the bundt look beautiful! have fun at MixedCon! Wish I could have gone! 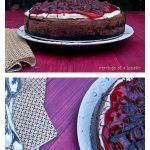 What a great use of your cherry extract! And what a pretty color of a cake for the holidays (and valentine’s day too). I know my niece would love this cake. I think this was an awesomely creative interpretation of the theme! I am so jealous that I could not go to mixed. I hope you are having a ball and a half. Love the cake. Shirley temples were always my favorite drinks. 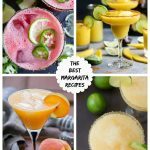 Such a clever non-boozy recipe! Brava! P.S. I finally made Trix Krispies with my nephews. Cocoa Krispies Krispies too. Rocked. The pink glaze sets this sweet cake apart and is so much fun! Wouldn’t it be nice for a baby shower or birthday party? Hope you have a good time at the conference. I have yet to go to one and think I’d really enjoy it. 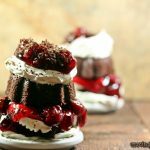 A Shirley Temple bundt cake for a boozy bundt? Genius! Totally appropriate, and tons of fun. And it looks pretty good, too! Truth is, booze is a great ingredient with some baked things, but IMO you have to be careful – too easy to ruin the flavor profile of what you’re trying to achieve. This is perfect – thanks. Shirley Temples were my favorite thing growing up. I am sure my parents cursed the day I ever first tried the drink. What a fun idea for a cake! I know all about yucky kitchen lights but sometimes that’s the way the cookie crumbles and we make the best of the situation. Though the photos don’t look too bad to me. I still want a slice. I hope you are enjoying the conference. 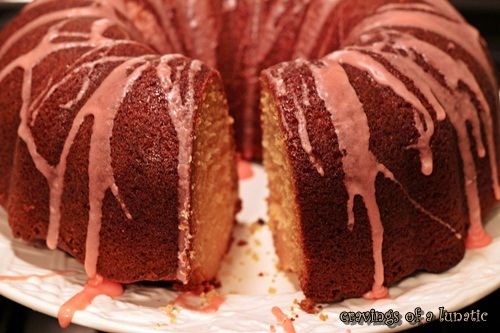 A Shirley Temple bundt cake?! This looks amazing! Shirley Temples always make me feel like a kid again!